In the first part, we discussed the intersection of proxemics and street style. In this part, we turn our attention to making fashion images. Fashion photography is very difficult because, despite the claims of books, website tutorials, and lighting-product pitches to the contrary, fashion photography is not technical. The more important aspect is the philosophical approach. 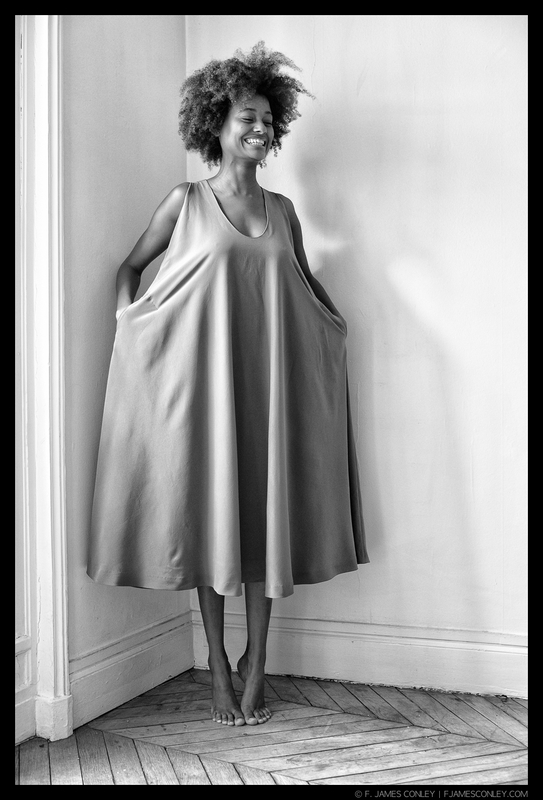 Working with CHV Design in Paris, the designer's primary concept with this dress was its drape—the way the fabric hangs and moves. Accordingly, the images about this dress emphasize its draping with movement. In most photography, the perspective and ideas of the photographer are primary: each situation to which a photographer responds and each image a photographer makes as a result of those visual interests reveals the surreal mind of that particular photographer. With fashion photography, not only is the subject intentionally chosen, but it is not the photographer's perspective that's important—it's the designer's. The designer has a creative goal in mind and "fashion" is the medium for the expression of that idea. When a model puts on a designer's creation, their respective goals will overlap somewhere. In observing the overlaps on this Venn fashion diagram, the photographer has the creative task of visually translating the different expressions, and reconciling them to realize the designer's intent as part of a cohesive whole. Making fashion photography about the technical is one of the worst things that can happen, because it shifts the emphasis to the photographer's creative vision and away from understanding the designer. The photographer most certainly must have a strong technical skill set and a large toolbox from which to draw, but the emphasis must always be on using those tools not to fulfill the photographer's perspective, but to expose the designer's vision. That process begins by understanding the goals of a collection. Fashion is—broadly—a form of protection and expression that individuals use to communicate deeper aspects of themselves. If we all made our own clothes, then the model would be the subject. But few of us design and make our own clothes. Instead, we select pieces which match a feeling, mood, thought, etc. In showing a collection, the goal of a fashion photographer is to reveal the designer's perspective as broadly as possible so that the viewer can see whether the designer's message is one with which the viewer identifies. If the model's personality is the primary subject (as in a portrait), then that message is obscured. The Designer. The primary audience is the designer. The photographer's primary job is making sure to capture and express the designer's intention. The other audiences are secondary, but it helps to understand them. Commercial buyers. Unless the photography is purely for documentary purposes (such as to show seamstresses how to assemble pieces), the designer will be using the images to sell the collection. Representatives from stores, boutiques, and other retail outlets look at collections and decide which ones to market. Commercial buyers are tasked with determining whether their customers will purchase the designs. Although commercial buyers are able to look past an image to the underlying designs, they're also inundated with a variety of boring studio images. Giving them something creative and energetic to look at is always a plus, and catalogs created for commercial buyers often have some of the best fashion photography that the public never sees. Clients. As with any other brand, fashion houses get loyal followings. Top customers often receive buyer catalogs, as well as limited run pieces, such as prints, magazines, or posters. The public. Publicity images may be drawn from the images made for marketing to commercial buyers, but more likely there will be a different campaign for the public. While commercial buyers need to understand the design of the clothes, the public wants to see the clothes in action. Fashion is a fascinating area of photography with incredible depth and diversity. Getting to work with creative minds and gorgeous models is exciting, but it sometimes gets difficult to capture the overall theme. If you get a chance to shoot fashion, make it your first step to set your own creative ideas to the side and instead understand the designer and the creative goal of the collection. With the right orientation, you'll be able to make amazing images that capture a neglected aspect of how we relate and express ourselves to one another.